The French racing driver Romain Dumas scores a unique achievement today at Colorado. Just a week after he scored his second overall victory at 24 hours of Le Mans, Dumas wins 94th edition of the Pikes Peak International Hillclimb. It is Dumas’ second victory at America’s famous mountain. He was the winner first time in 2014. 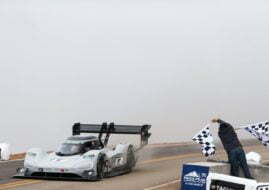 Dumas was driving Norma M20 RD Limited and he climbed to the summit of the Pikes Peak for 8 minutes 51.445 seconds. On the 20-km track, with 156 turns, the second fastest driver was Rhys Millen, who raced in the Electric Modified class with eO PP100 prototype. His time was 8 minutes 57.118 seconds.